Location: East Lavant, West Sussex. OS Explorer Map 120, 'Chichester'. 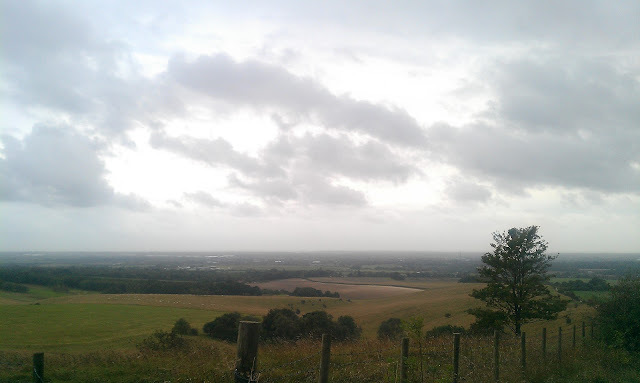 Starting GPS Co-ordinates: N50 87' 10" W000 77' 20"
Finishing GPS Co-ordinates: N50 89' 20" W000 76' 20"
To see: Chichester, Goodwood, 'The Trundle', Devil's Ditch, flint mines, the view! A great green lane, this one, offering fine views and plenty of items historical interest. Starting at the southern end, in the pleasant village of East Lavant, this remarkably straight trail heads uphill almost due north on a surface of crushed chalk and gravel. The surface seems to be well maintained as well, at least on southern parts of the lane, as potholes have been filled with shingle. After travelling about half of the lane's total length, however, axle-twisting washouts have begun to develop in the surface of the byway. It's never all that bad to be honest, but careful negotiation must be undertaken occasionally. 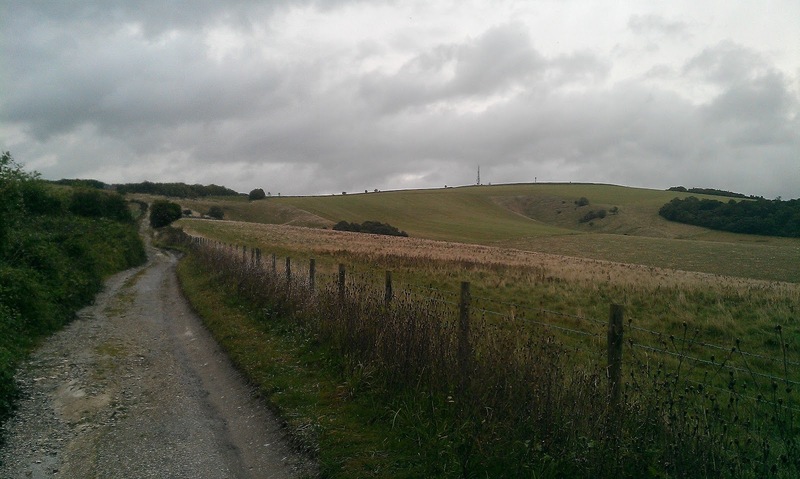 A climb of 120m up a gentle gradient between Haye's Down and Lavant Down is soon encountered. On the way up the byway passes some reservoirs to the east, where the aforementioned washouts begin, and after which some lovely views across to the east are offered, spoilt only by an accursed golf course. (We consider these 'green deserts' a total waste of land and should be returned to nature. Please excuse the rant.) Further up the hill and towards the end of the green lane there is unfortunately evidence of illegal off-roading, as trails (picture) have scarred the banks to the west. DO NOT DO IT! It is illegal, immoral and destructive behaviour on a par with fly-tipping, and it makes us despise you (please excuse our second rant!). The lane ends at the car park on top of St Roche's Hill, just short of Town Lane. To the north is 'The Trundle' Neolithic hill fort is well worth an investigatory climb to take in the incredible views it offers in every direction. To the east of the lane were some Neolithic flint mines and other earthworks, though not much can bee seen today. To the south can be found the extensive Devil's Ditch, which is part of the Chichester Entrenchments dug in the iron age and are believed to be a defensive feature to protect the area from attacks by more northerly tribes. Nearby to the west lies the great city of Chichester, which is well worth a visit. Also nearby is Goodwood aerodrome and motor racing circuit, which I am sure needs little explanation. Even on a miserable day it's a great view. this is part of the south down national park, which I think due to new law its illegal to drive down. Please correct me if I am wrong.. Thanks for your comment, Charles, & welcome. I have not personally heard that any particular byways have been reclassified as a direct result of the creation of the SDNP, and an in depth Google search yielded nothing, however I am sure there could be some truth to what you claim. Would you mind saying where you got this info from and why you think it is now illegal to drive it? I shall do more focused research based on your findings. Thanks! What was the outcome on this please? There is, as far as I have been able to discover, certainly no 'blanket ban' on driving byways in the SDNP. However, that said, many byways have had TRO's placed on them (a specific example being Comp Lane near Alfriston: http://www.moderndayexplorers.net/2011/02/boat-comp-laneold-coach-road.html) and as such, it remains best practice to check the status of each byway one plans to drive before visiting using the Definitive Maps.